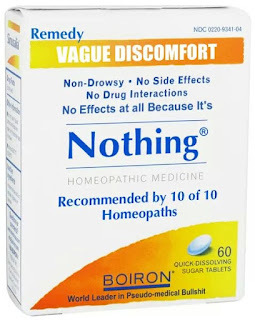 Homeopathy is the belief that placing a poisonous substance into water, then diluting that water to the point where no molecules of the original substance likely remain, creates medicine. The water, they allege, remembers what the poison was like, and will then cure diseases with symptoms similar to the poison's toxidrome. They achieve this by diluting one part of poison into 9 parts of water, then diluting one part of the subsequent poison solution into 9 parts of water, and so on. At each dilution step, the water is beaten against some plastic or leather to make it remember the poison better (a practice they call "succeeding"). 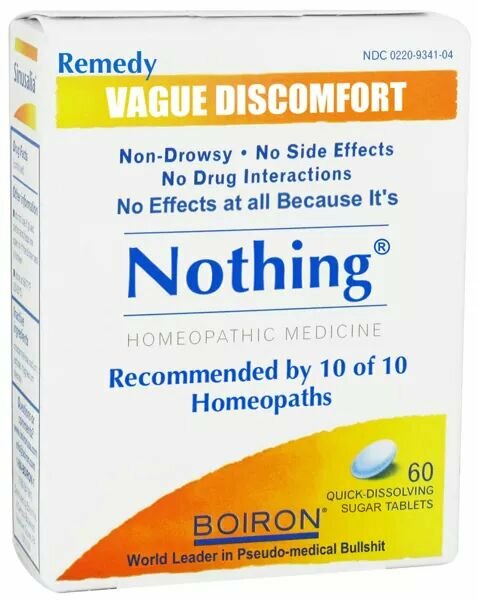 These dilutions are labeled as 1X, 2X, etc, and homeopaths believe that with each dilution the medication becomes more potent. Let's consider that for a moment. I used to live on the Coast, and on more than one occasion I took a leak into the ocean. I'll estimate that I micturated 1 liter into the sea. The USGS says that all the world's oceans, seas and bays contain over 1.3 billion cubic kilometers of water, or 1.3 * 10^21 liters. We can just use 1 * 10^21 for ease of math. My pee into the ocean equals a 21X homeopathic dilution, which homeopaths would consider to be a good and potent solution. After succeeding to 21X by the crashing waves, my very potent pee then evaporated into the clouds, and was carried to the world's drinking water reservoirs, where it was further diluted and succeeded, increasing its potency, before being pumped into the homes of eagerly awaiting homeopaths, who then drank my piss. Homeopathy is pseudoscience and obviously doesn't work. Unfortunately, loose controls on these predatory snake oil manufacturers has lead to situations where ACTUAL POISON WAS LEFT IN CHILDREN'S HOMEOPATHIC PILLS. Homeopathy should be regulated out of existence, and if you don't agree with me, drink my piss.